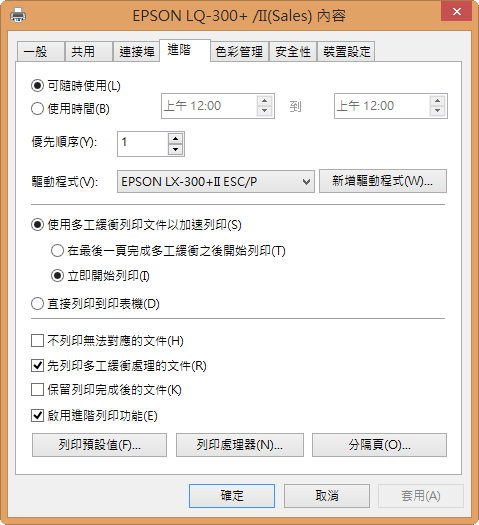 Epson LQ-300+ II如果用Windows 8的內建驅動程式安裝的話, 會安裝失敗. 所以必須要Epson網站下載LX-300+ II驅動程式(是的! 裝的是LX-300+ II driver), Windows 8 64bit則選擇Windows Vista 64bit, Windows 8 32bit則選擇Windows Vista 32bit下載. 下載後解壓縮, 重新安裝Epson LQ-300+ II, 並將驅動程式位置指定為解壓縮後的資料夾. 就可以正常使用Epson LQ-300+ II.